Marijuana or hemp is famous for all the wrong reasons. While the world knows the dark side of this plant, the industry finds immense potential in another variant of hemp. Hemp seeds are used in textiles, food, and as an oil. Apart from all these, the variant that is becoming popular is hemp milk. Hemp milk, contrary to your belief, is extremely healthy. It is a bounty of fatty acids, vitamins, minerals, and plant proteins. And because it is a non-dairy source of calcium, hemp milk is a vegan’s soulmate. Shocking, isn’t it? Read on to know more about the goodness of hemp milk. What Is Hemp Milk? 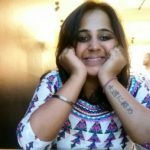 Why Is It Good For Health? What Are The Risks Or Side Effects Of Having Hemp Milk? Hemp milk is made from the hulled seeds of the industrial hemp plant. This includes varieties of Cannabis sativa that are low (<0.3%) in tetrahydrocannabinol (THC) (the psychotropic substance) and are grown for food and textile uses. Strictly speaking, hemp milk is not actually ‘milk.’ It is more of a drink made with soaked or unsoaked hemp seeds blended with water. This seed milk has a pronounced earthy flavor that not many might like. But it contains more protein than other non-dairy alternatives. Hemp milk is one of the best options out there for vegans and anyone with gluten- and soy-intolerance. 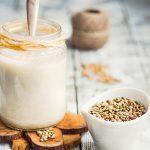 Hemp milk is also rich in omega-3 and omega-6 fatty acids, magnesium, calcium, fiber, iron, potassium, as well as the unique phytosterols (1). You might just be wondering how hemp milk does good to you. Well, check out the next section. Hemp seed is a natural reservoir of linoleic acid. Research supports the cardioprotective effects of a high-linoleic acid diet (2). Though the mechanism is still unclear, linoleic acid decreases the production of pro-inflammatory chemicals in your body. This means that there is less inflammation of the blood vessels and cardiac muscles. In a way, hemp milk might help cut the risk of atherosclerosis, coronary artery disease, hypertension, and related cardiac disorders (2). Since the seed is rich in phosphorus, calcium-fortified hemp milk can be an excellent alternative for cow or goat milk. Also, hemp milk could contain high levels of pro-vitamin D. Your body can utilize it in bone formation and bone mineralization. If you are a vegan or have lactose intolerance, consuming plant-based, non-dairy milk varieties can protect you from osteoporosis, osteoarthritis, and other age-related bone diseases (3). Contrary to what its nutritional profile says, hemp milk could help you maintain a toned physique. Though it is high in fatty acids, the milk boosts levels of good fats. It reduces cholesterol accumulation and restores the LDL-HDL balance. Drinking hemp milk would keep you full – and away from hedonic hunger pangs. 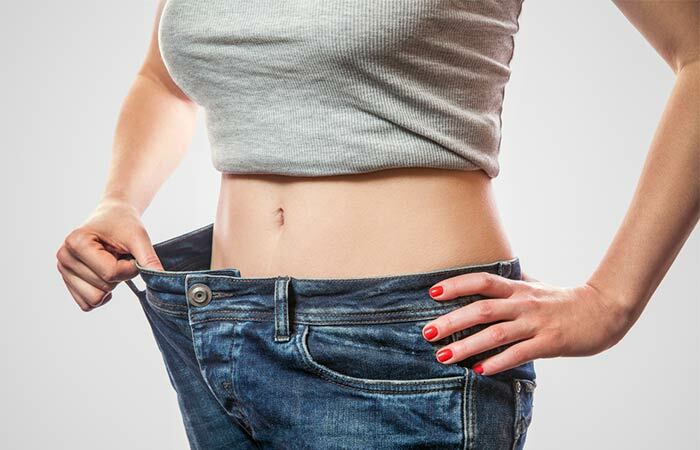 This way, you wouldn’t binge and put on weight. But one major drawback with hemp milk is that it is low in protein. Yes, it has more protein than other non-dairy alternatives, but it doesn’t have enough of it. You could probably add protein mixes or try other means of fortification to compensate the deficit. Your skin is an oil reserve. The epidermal cells secrete oils that preserve the texture and health of your skin. Essential polyunsaturated fatty acids (PUFAs) are metabolized in the skin. They produce molecules (like eicosanoids) that are responsible for the structural integrity and barrier function (4). Hemp milk is rich in linoleic acid. Topical application and oral supplementation of this plant-based milk might alleviate skin sensitivity, inflammation, and symptoms of photoaging. Hemp oil is another effective option you could try. Dairy products from cow, goat, or buffalo are not the only sources of vitamin D and calcium. In fact, in many countries, people are intolerant to lactose-containing products. Infants, generally, are lactose intolerant because of an underdeveloped gut. As they grow, some children fail to adapt to animal milk and have to be dependent on non-dairy sources of calcium. Hemp milk is a great choice for such children. 100g of hemp seeds have 2277 IU of vitamin D. That’s a lot! Children won’t be missing much if they drink hemp or soy milk. The taste and smell might be a put-off, though. Good luck with draining hemp milk down their throats! But, let’s get practical. Where can you find hemp milk? Is it found on the market shelves? Hemp milk is available in supermarkets and is popular among vegans and people caring about their health. But here’s a surprise – you can make it at home! We have a simple recipe for you. Check it out! In addition to hemp seeds, you can also use almonds, cashews, flaxseed, macadamia nuts, pumpkin seeds, sunflower seeds, or walnuts to try this recipe. Soak the hemp seeds for 6-10 hours (soaking the seeds will activate enzymes that aid digestion and absorption). Rinse the soaked seeds in a colander. Transfer the washed seeds to a blender and add water (¼th seeds and ¾th water – depending on the consistency you need). Blend the contents at high speed. Add honey or maple syrup or a sweetener of your choice. Once evenly blended, pour the thick sweetened milk into milk jars or bottles for storing. Add cinnamon, nutmeg, or vanilla to give it some extra flavor. This is because hemp milk has a distinct odor that not many like. If you prefer chocolate flavored milk, add some cacao powder. As there are no preservatives to preserve the milk, it might go bad faster. Consume this hemp milk within 2 days. Let’s get to the next obvious question. Can we drink this seed milk like other nut or seed milk preparations? Valid question, because these seeds could have traces of psychoactive elements. Like the benefits of hemp milk, the side effects have also not been studied and documented well. A lot of people do not prefer hemp milk because of the psychoactive effects it might have. But such claims are untrue. Although hemp milk has high amounts of essential fatty acids, vitamins, and minerals, it is comparatively low in protein. So, obese individuals, those with severe cardiac issues, and those looking to build muscle could choose soy or almond milk over hemp milk. The nut-based and other plant-based milk variants have higher protein content and can boost your physique better than hemp milk. If you don’t like the taste or smell of hemp milk, you can substitute it with soy milk, rice milk, almond milk, flax milk, coconut milk, oat milk, or even quinoa milk. A significant fraction of the global population is suffering from serious effects of lactose intolerance. In such a scenario, plant and seed-based milk varieties are the most preferred. Hemp milk is one of the rare yet healthy options currently trending in the market. Hemp milk is a treasure chest of macro- and micro-nutrients. With hemp seed having one of the highest concentration of linoleic acid and vitamin D, its milk can be the best source of stamina for vegans. 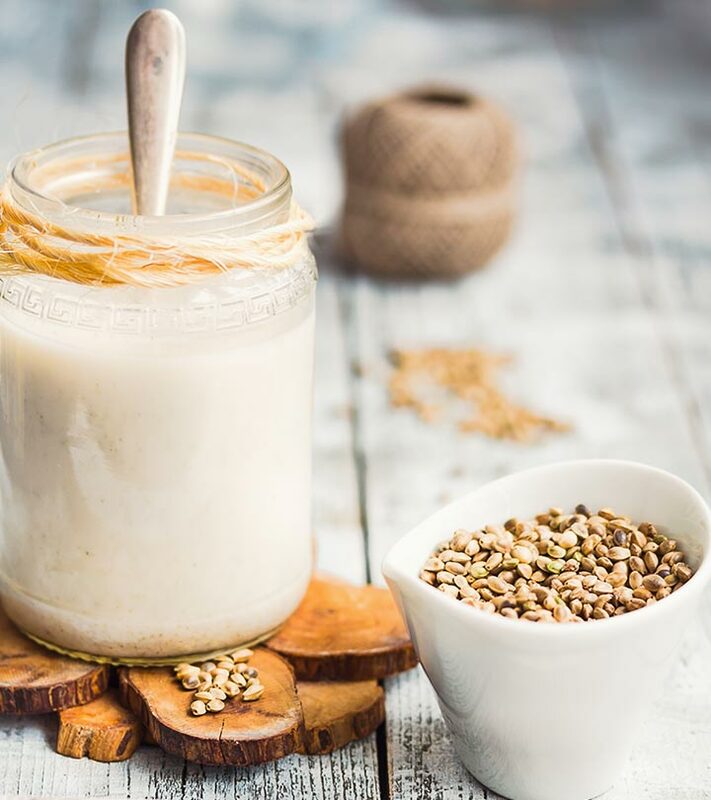 If you are a vegan, lactose-intolerant, or simply looking for a change in your dietary regimen, we urge you to try hemp milk. You can replace it with cow or goat milk and enjoy it without any apprehension. If you liked this read, please send your feedback, comments, and suggestions using the comments box below.